Curtiss-Wright Surface Technologies is a division of Curtiss Wright, based on site at Airbus UK in Broughton, Chester. The company is a metal improvement and component coating facility, using state of the art robotic equipment, designed and manufactured in-house. The client came to Thelwell Flooring with the instruction of installing a new fast curing floor surface to their factory floor over a single weekend, in order to avoid disruption to production and operations on site. The new factory flooring is set to provide a seamless and hard wearing floor in order to allow for the heavy footfall and vehicles required. Curtiss-Wright’s requirements included a bright colour scheme to clearly define forklift truck routes, walkways and pedestrian crossings on the factory floor. 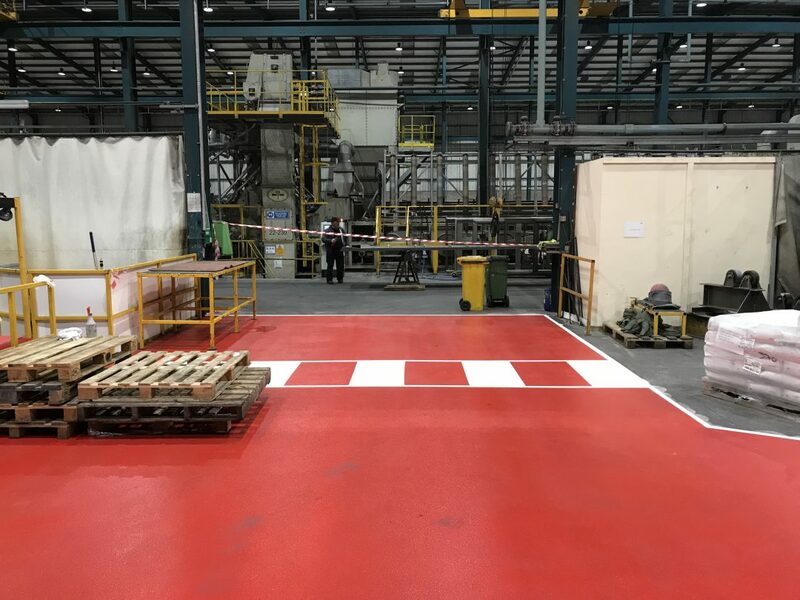 The line marking for resin flooring allows for the easy separation of both pedestrians and vehicles on the factory floor whilst also meeting health and safety guidelines for both employees and any members of the public that may be in the area. The finish of the floor needed to be anti-slip due to the type of production area the factory holds. The materials used and produced within the factory tend to be greasy and wet, due to the products used and processes carried out in order to strengthen wings for the aircrafts. The anti-slip flooring allows employees to walk confidently leading to maximum productivity within the workspace and once again helps to meet all relevant health and safety requirements. Thelwell’s first port of call was to mechanically prepare the existing concrete surface to remove any traces of the old floor paint and to provide a positively profiled surface texture to adhere the new resin floor system. The VIP Quickfloor system was installed due to its superior fast drying properties and overall durability and strength. One of Quickfloor 500’s typical uses is for aircraft hangars, which ultimately made it the perfect solution for the task at hand. The work was completed by the Sunday afternoon whilst employees worked in and around the area and allowing the floor to be back in full operation within 5 hours. Do you need brand new line markings or anti-slip resin flooring for your factory floor in Chester? Get in contact with Thelwell Flooring on 0151 200 1038 or fill out our online contact form and we’ll get back to you as soon as possible.